Peonies are the stars of any garden in early summer. Their heady fragrance and voluptuous flowers make them a must-have perennial. Gardeners treasure two main types: the herbaceous cultivars, which die back to the ground each autumn, and tree types, small shrubs with woody stems that lose their leaves in the autumn. Both produce the buds for next year’s flowers in the fall. On the tree types (Paeonia suffruticosa), these buds form mostly on the stems above the ground. In herbaceous cultivars, the buds are formed underground at the crown of the plant, which makes them more hardy in northerly climates. Most herbaceous types are hardy from Zone 8 to Zone 2, with some exceptions. The best-known herbaceous species is Paeonia lactiflora, also known as the Chinese peony because of extensive breeding work done by Chinese horticulturalists. The popular double-flowered cultivars that most of us grow almost all come from this species. Most varieties flower for about a week in late spring to early summer, but you can extend the period of bloom for six weeks by choosing early, mid- and late-season cultivars. Flower colors range from white and yellow to shades of red, pink and mauve – any color except blue. As for scent, most double flowering types are more fragrant than singles, and pinks tend to be more fragrant than reds. Soil and light: These perennials grow two to four feet tall and thrive in sunny flowerbeds and well-drained soils. Although they tolerate a wide range of soil types, you’ll have the best success with good soil rich in organic matter. Feeding: They are heavy feeders, but whether or not you need to add fertilizer depends on the type of soil you have. Clay soils tend to be more fertile than sandy soils. With sandy soils, adding nutrients will help ensure your plants thrive. It’s better to use compost or well-rotted manure to feed perennials than chemical fertilizers. Top dressing around your plants each fall with compost does a lot to improve the soil structure as well as its nutritional content, however, don’t dump the compost directly on the crown of the plant, but rather in a circle around the plant. If compost isn’t available, use a granular fertilizer higher in phosphate and potassium than nitrogen and scratch it into the soil around the crown in early spring and fall. My plants aren’t blooming? What’s wrong? 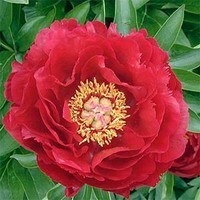 Can I grow peony plants from the seeds? How do I care for these perennials? The leaves on my plants don’t look healthy – what’s wrong?